Farewell Favorites: Home Drug Co.
1200 Union Street The Home Drug Co. at Hyde and Union was among the last of a dying breed, the neighborhood drugstore. Operating as a pharmacy at this location for almost the entire 20th Century, The Home Drug Co. was done in by HMOs and chain companies. According to its leasing agent, the property is something of an albatross. The company has had no serious interest in the property at the time this item was posted in June, 2001. The 1,100 sq.-foot store requires expensive upgrades in order to become compliant with the Americans with Disabilities Act. It is unlikely that a pharmacy will exist again at this location. 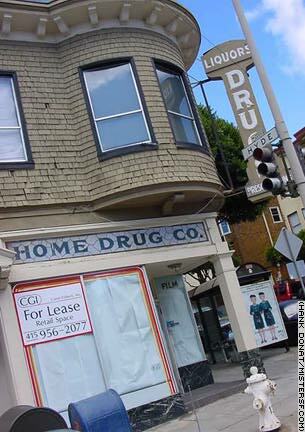 The former longtime drugstore is located directly across the street from Swensen's Ice Cream Parlor, one of San Francisco's most enduring neighborhood institutions. More about Home Drug Co.